U.S. Supreme Court Justice Ruth Bader Ginsburg speaks after the screening of "RBG," the documentary about her, in Jerusalem, Thursday, July 5, 2018. Ginsburg says she hopes the traditional "bipartisan spirit" of congressional hearings for judges will once again prevail rather than recent votes that have divided along party lines. Supreme Court Justice Ruth Bader Ginsburg said Sunday she thinks she'll remain on the high court for at least five more years. Progressives already worried about retiring Justice Anthony Kennedy's exit have feared losing Ginsburg next, NBC News reported. 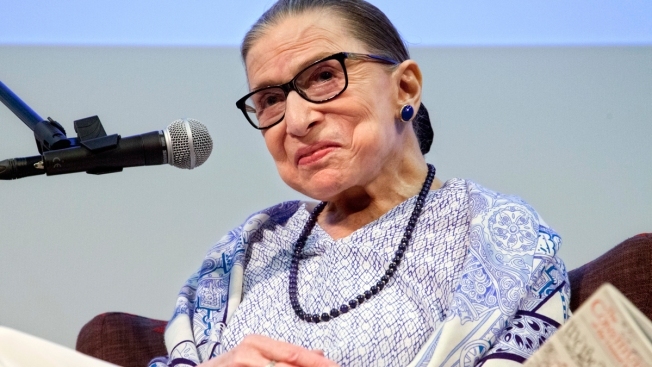 “I'm now 85," Ginsburg told CNN. "My senior colleague, Justice John Paul Stevens, he stepped down when he was 90, so I think I have about at least five more years." Her comments come weeks after President Donald Trump nominated conservative judge Brett Kavanaugh to replace Kennedy, a key swing vote on the court.